Ramona L. Rand-Caplan is a doctoral student in American Western History at the University of New Mexico. 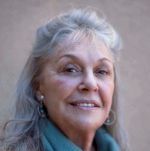 Her published work includes “Aunt Sally: She Rode with Custer” in John P. Hart, ed., Custer & His Times, Book Four (LaGrange Park, IL: Little Big Horn Associates, Inc., 2002). Ms. Rand-Caplan was the Clinton P. Anderson Fellow at the Center for Southwest Research at UNM from 2003-2006, and the Beatrice Chauvenet Fellowship at the CSWR in 2006-2007. Her master’s thesis “The Saga of the Sevilleta” is a detailed history, including oral history interviews recorded with grantee descendants, of the Sevilleta Land Grant in New Mexico from Spanish Colonial times to the present. The Sevilleta is unique among land grants, the only grant whose restored common lands are now a National Wild Life Refuge. Ms. Rand-Caplan has worked as an oral historian for the New Mexico Farm & Ranch Heritage Museum since 2003.